Nigeria has been the front line in an unholy war for the heart and soul of Africa. Along the battlefront the two major religions of Islam and Christianity endlessly spill blood in the name of a god that seems to have looked the other way. Villages are used as urban battlefields and the open wasteland of sub-Saharan Africa acts as no-man's land. Civilians who withstand the urge to join the militants that come and go are left helpless as governments struggle to maintain control. Mutilation, open massacres, and rolling gunfights become far too common as Africa's children watch their hope for a better life go up in smoke. And for what? So that faith can bleed out entire countries? So that religion can gain a foothold while breaking the back of Africa? Amongst this senseless violence is not surprising to find militant groups that use faith to entice their terrorists into endless war. Christian groups (such as the LRA in Uganda) loosely hide behind the cross as they enlist children to die like men for a cause not their own. Islamist groups pitch Sharia Law as a solution for Africa's ailments while creating a laundry list of new ones. In Nigeria the latest bastards to join the fight got their start back in 2002. Boko Haram, which roughly translates to "Western education is forbidden", dragged out 14th century ideals and perverted ideals of what the Qur'an teaches to create a movement in northwest Nigeria. The overly legalistic approach to Islam that would define Boko Haram in Nigeria originated with the Islamic cleric Mohammad Yusuf. Through his attempts in the 1990's the movement in Nigeria was able to gain traction by 2002. It was packaged and preached to young Muslims as a way of fighting back against the West and the Christian dominated south in Nigeria. In it's packaging any verse in the Qur'an that preached tolerance appeared to be omitted while others were perverted to justify "jihad". Of course no good "jihad" movement gains traction by first telling it's new followers to pick up a gun and prepare for paradise. Yusuf started out by telling his followers to mock and isolate Muslims in northern Nigeria if they dared to participate in anything Yusuf saw as helping the government. This was highlighted in Yusuf's preaching that Nigeria was illegitimately run since it refused to follow strict Islamic laws (ultimately Sharia). In doing so, Yusuf would transition his message of withdrawing from Nigerian society and governmental programs to a message of Islam's supposed dominance to the secular state. Sowing the seed of dissent, Yusuf hid behind religion as his message grew more openly sinister. "Withdraw" soon became "resist". And "resistance" soon became "violent resistance". By the time Boko Haram had reached a reasonable following Yusuf was already preaching to his faithful a message of rebellion and terrorism. In 2009 those seeds sprang forth as Boko Haram's message came to fruition. In July of 2009 the Boko Haram followers pushed the envelop one step too far for Nigeria's police. What seemed like a petty offense (refusing to wear helmets on motorbikes) was the militants' way of antagonizing the state. It was far from the first stage of antagonism deployed by Yusuf's little anarchists. But it was the last stage before the peace broke down and open rebellion began. When police began cracking down on Boko Haram militants the terror group let loose with all guns blazing. Like children throwing a fit, the foot soldiers of the Boko Haram movement unleashed hell in an attempt to gain attention. 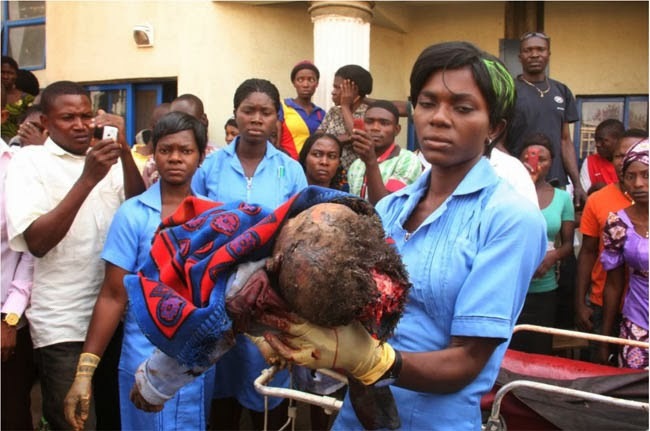 In this terror campaign over 800 Nigerian citizens would lose their lives to grotesquely senseless violence. The military of Nigeria was called in so as to restore law and order. What had been a simple crime was now all out war. And as with all incidents where a corrupt government is given reason to flex it's muscles; the situation rapidly deteriorated. On one side the civilians trapped in the middle had militant thugs and on the other a military hellbent on showing who was in charge. Nobody would come out the winner here. In the end Mohammad Yusuf would be executed publicly as the state attempted to show all of Nigeria who was in control of northwestern Nigeria. It was an act of capital punishment that would do anything but solve the problem. With one man's blood, Nigeria's government shattered any hopes of peace and radicalized a generation of Islamist. This had given a movement it's martyr. Bastardized, Boko Haram was ready to exact it's pound of flesh. Nothing was sacred to the scorned movement. Suicide attacks began almost as soon as Yusuf was dispatched. Over the next five years this hellish movement would leave thousands of Nigerians dead as Boko Haram pursued Yusuf's dream of an Islamic state in Nigeria. The tactics deployed by Boko Haram became increasingly more perverse and barbaric as the members within the movement challenged each other for control. Students from colleges and grade schools became prime targets for the hedonistic leadership of Boko Haram. In September of 2013 terrorists from the movement attacked and killed 65 students at the agricultural college in Yobe state, Nigeria. These sorts of targeted massacres have also been accompanied by suicide attacks and bombings of schools across northern Nigeria. This strategy of attacking schools follows the underlying ideal within the movement that "Western education is forbidden". In the beginning the movement would had called for it's members to simply withdraw and be completely unassociated with Nigeria's state schools. It would had encouraged it's followers to seek out Islamic schooling in place of secular education. This would had been a peaceful, if uneasy, way of pursuing a future in which northern Nigeria's youth were completely uneducated (in the modern sense). Yet today it is clear that this message has been completely perverted into one of violent destruction of all "Western" educational systems. Today Boko Haram seeks to kill those who participate in Nigeria's state run school system. Muslims who dare to seek an education within the system are placed at a higher risk of being murdered due to Boko Haram's hardline teachings. It's devotion to a "pure Islamic" system of governance and education means that all Muslims and non-Muslims are meant to subject themselves to the Mosque rather than the state. There is no room for tolerance or freedom of choice. Within this framework of what a Boko Haram style Nigeria would look like there is little left to the imagination as to why just this past week 43 students were gunned down. It is easy to see why Boko Haram burns schools and bombs others. It is built into the teachings of the Boko Haram movement that children who are educated by the state system are somehow polluted and a threat to the Islamic system of religious dominance. And thus why the children of Nigeria, all those who are enrolled in education, must pay in blood for Boko Haram's version of Nigeria to become a reality. Much of what Yusuf started when he created this movement was built out of capitalizing on social grievances many Muslims in Nigeria's north have felt for countless years. Yusuf simply had to pander to the existing dissidents while feeding others with a sense of having been wronged by the state. Mixing in extremist rhetoric allowed Yusuf to deepen the divide that was already growing within Nigerian society. The efforts made by Boko Haram to feed the anger within Nigeria's Muslim community were only further highlighted by Nigeria's government itself. Corruption within the court systems and military put increasing pressure upon all of Nigeria's population. But it was felt disproportionately in Nigeria's northern states as the government increasingly made it's Muslim population feel disenfranchised and marginalized by the state itself. All Boko Haram had to do was come along and give a name to the anger that was festering beneath the surface. Yusuf gave a cause behind which that anger could be harnessed. And in doing so, Yusuf created a beast that Nigeria has to this day been unable to tame. Crimes against humanity have become characteristic of the fight between Boko Haram and the government of Nigeria. Both parties have actively sought to demonize the other while persistently bleeding the innocent population of their security, their future, and in far too many cases... their lives. Nigeria's Joint Task Force (JTF) of military and police have over the years been seen as thugs themselves. The police in Nigeria have been accused of killing at will, often shooting first and asking questions later. Though many who remain sympathetic to the fight against terrorism globally see this as combating a violent jihadi organization, the tactics often galvanize support for Boko Haram rather than end the group's ability to fight. Meanwhile the civilians the police are meant to protect pay for the polices' brutality in loss of property and at times with blood. Yet Nigeria's government, as corrupt as it is, has no option but to find some method with which to end Boko Haram's barbarism. No modern state can be expected to tolerate having truck drivers beheaded with chainsaws on it's highways. The constant flow of blood and sustained anarchy must be ended if Nigeria expects to move forward in any manner of speaking. In the meantime the government of Nigeria faces a war with it's own citizenry. From this point it appears to be a war of scorched earth that pits one religion against the other. It appears to be a war that divides a nation along the lines of politics and faith. A war where one party wishes to drag a country back to the 14th century while the other wishes to exploit it's populace and push for a secular state. There doesn't seem to be a winner in Nigeria no matter how this battle ends. All there appears to be is a country split by religious fervor and perverse ideology. Leaving it's average citizen to scrape out a living amongst the bloodshed, corruption, and oppression of politics and faith alike. This installment in this series is just the start of Alder's Ledge's look at the long battle front that stretches across Africa. As we hinted at in the start of this series, we believe this battle for the soul of Africa often is characterized as the fight between Islam and Christianity for religious dominance in regions of Africa. And in looking at this struggle between the two faiths we will look at places like Nigeria, Sudan, Uganda, and Niger. All the while we will be attempting to remain fair in our depictions of the problems that arise from this issue. At no point are we taking sides or attacking either faith. We are simply attempting to bring attention to an issue that many overlook.